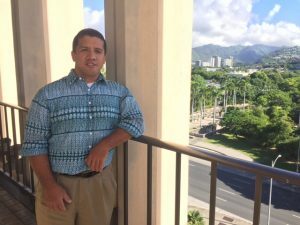 Thomas Kahalu Lee, Jr. knows what it means to be a “Wounded Warrior.” He lost his right leg above the knee in Iraq but not his commitment to return to serve his island home. Lee, 40, is the governor’s new military affairs liaison, a position created by the Legislature last session to assist with community relations involving the military and state government. His job can include everything from dealing with quarantine issues for the pets of military families to understanding community concerns about fuel leaks at Red Hill and working to prevent them in the future. “We’re honored to have Tom filling this first-ever position for Hawai‘i,” said Gov. Ige. He also said he wanted to honor the legacy of the late U.S. Sen. Dan Inouye in recognizing the vital role of the military in the islands. 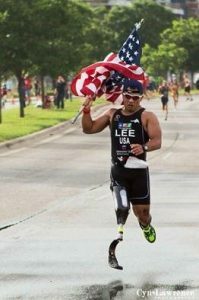 Lee’s own inspiring story is one of bravery and perseverance, even though he would be too modest to call it that. A 1993 Moanalua High School graduate, he joined the Navy and was honorably discharged in April 1999. He was working on his college degree when the World Trade Center and the Pentagon were attacked Sept. 11, 2001. Those tragedies and a sense of duty compelled him to re-enlist — this time in the Army — but before he could deploy, he was diagnosed with testicular cancer. After successful treatment, he went on to serve in Afghanistan. However, his next deployment in 2007 to Taji, Iraq, near Baghdad nearly cost him his life. Lee received a Purple Heart based on the severe injuries he suffered, including a severed brachial artery and amputation of his right leg above the knee. Although he has managed a successful transition to civilian life, does Lee worry about his fellow vets who have challenges with PTSD and other issues? Read more of our November issue here.